« Is Podcasting Apple’s Instagram Opportunity? 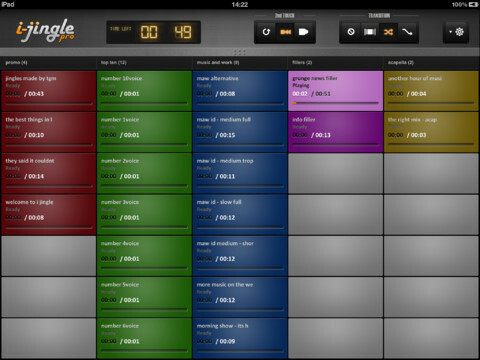 I-Jingle Pro is an app that turns your iPad into a professional jingle/sample cart player. Easy to use controls let you either play up to 8 jingles simultaneously, cross fade 2 jingles, fade out the first jingle while starting the next or simply stop the first and start the next. So called 2nd touch settings allow you to stop, fade out or re-start a jingle. At any moment you have 35 jingles on screen and scrolling up and down through the jingles or quickly switching between presets allows you to access up to 300 jingles without leaving the main screen. I-Jingle Pro is $24.99 in the App Store. Note: I-Jingle Pro is not recommended for the iPad 1.